SAN DIEGO, June 4, 2018 /PRNewswire/ -- ASMS 2018 – Laboratories can minimize interference and maximize instrument uptime with a novel range of flush solutions for liquid chromatography mass spectrometry (LC-MS) systems and a new line of ultrapure solvents for ultra-high-performance LC-MS (UHPLC-MS) systems. The Thermo Scientific product range now includes ChromaCare flush solutions and UHPLC-MS ultrapure solvents (acetonitrile, methanol, water and IPA). ChromaCare reagents are designed to reduce contaminants and prevent protein precipitation. New UHPLC-MS solvents are helping to raise the bar in instrument performance and to maximize productivity across pharmaceutical, biotech, clinical and academic laboratories. Thermo Fisher Scientific is showcasing these new products during the 66th American Society for Mass Spectrometry (ASMS) Conference, held June 3–7, in the Sapphire Ballroom ABEF at the Hilton San Diego Bayfront, San Diego. "Keeping LC-MS instruments performing at the highest standards for optimal laboratory efficiency has been a common challenge for researchers," said Kelly Miller, vice president/general manager, laboratory analytical reagents, Thermo Fisher. "With that in mind, we've developed our new ChromaCare family of flush solutions for use with Thermo Scientific analytical instrumentation, eliminating the need for toxic chlorinated solvents that can degrade seals. When used alongside our new UHPLC-MS solvents, customers can maximize instrument uptime and accelerate their groundbreaking research." Developed for both start-up and upkeep of delicate LC-MS columns and chromatographs, the ChromaCare range includes two new reagents designed to ensure seamless operation of Thermo Scientific LC-MS systems. The LC-MS Instrument Flush Solution reduces background noise, facilitating instrument installation and preventative maintenance routines for optimal performance. The LC-MS Biologics Flush Solution prevents proteins from clogging probes, minimizing instrument downtime and preserving sample integrity. The new ultrapure solvents can help scientists push the detection limits of UHPLC-MS systems to achieve high-quality separation results by enhancing mass sensitivity and resolution, reducing formation of metal ion adducts and improving peak profiles. The solvents enable optimal signal-to-noise ratio while keeping UV-absorbing and MS-ionizing impurities to a minimum, providing baselines with an extremely low level of background interferences, regardless of the detector used. Because they are ultra-filtered, the solvents are designed to reduce downtime due to clogging of the instrument, columns and check valves, helping to meet the continuous workflow demands of laboratories. Packaged in borosilicate bottles, the solvents also reduce leaching of metal cations to avoid sample contamination. 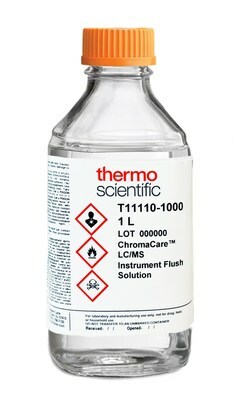 For more information on ChromaCare flush solutions and UHPLC-MS ultrapure solvents, please visit www.fishersci.com/ThermoSolventSolution.